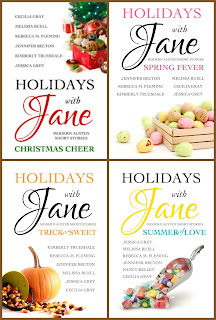 I was recently joined by Jessica Grey, one of the authors of the ‘Holidays with Jane’ anthologies. 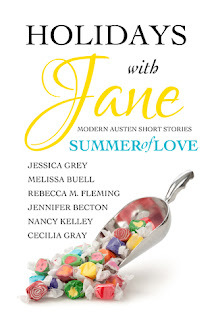 The summer-themed book ‘Summer of Love’ was released last month – you can see Jessica’s guest post about the book here, along with synopses of the short stories. Here’s what I thought about the book. The ‘Holidays with Jane’ series has six authors each writing modern, short-story updates of the six main Austen novels. Each anthology is themed around a time of year, so there are ones titled ‘Christmas Cheer’, ‘Spring Fever’, ‘Trick or Sweet’ and this, the fourth instalment in the series, is ‘The Summer of Love’. “I don’t look that bad, do I? Anne asked plaintively. “Anne, you’re wearing tan and beige. Yesterday you wore brown and gray. You’re like one of those little birds on the Nature Channel who is trying to hide,” Hallie said. Anne in ‘Persuasion’ was stuck living with ungrateful relatives, but those were the times that she lived in; she didn’t have the choices that a modern woman would have. Although I pitied Anne in this story, I didn’t admire her in the same way that I did the original Anne Elliot, who made the best of her situation, despite social constraints and her heartbreak. I liked the fact that this story showed Anne and Finn’s original romance, but I would have liked a little more interaction between them before the end of the story, things moved too fast for me here. Haha! I love that the author managed to get in a reference to muslins, as the discussion with Henry Tilney in ‘Northanger Abbey’ where they are discussing muslins is just so adorable. This was a sweet update of 'Northanger Abbey' and it was satisfying to see Cat discover that the Thorpes weren’t the friends she had thought they were. Cat is less gullible than Catherine Morland so the difficulty of making her misinterpret the Tilneys’ father is far less. There is a lot of discussion in the story about books and making up stories, which I thought was a nice touch, considering all the discussion of the novel in NA. ‘Mrs. Jennings had an uncanny way of spotting the smallest attraction between people, and then, she would begin planning their first date, their engagement part, and finally their wedding. There was so much in this story that I really enjoyed. I loved the humour in the story and highlighted so many passages! Mrs Jennings is such an amusing character and I liked the scenes where Brandon was introdued. The character of Marianne was as earnest in her endeavours as her S&S counterpart and her care for her sister is lovely. There were some lovely nods back to S&S that I enjoyed too. I am nowhere near as familiar with S&S as I am with P&P but there were some things that I picked up on, such as Edward admiring the uniting of utility and beauty and Edward’s brother having a toothpick storage solution (when we first encounter Robert Ferrars in S&S he is looking at toothpick cases). This was such a great story, a real highlight of the book. ‘Firecracker’ by Jessica Grey updates ‘Emma’ to see her as a summer camp guidance counsellor. This makes perfect sense; I mean, who would be better at guiding others?! This was my other joint favourite of the anthology. Emma is popular, outgoing and somewhat clueless in the real feelings of people around her. Her best friend is her next door neighbour Ben Knightley, whose older brother is married to Emma’s older sister, so there’s a family connection too. Ben is senior to Emma at the camp, but he is also very slightly under Emma’s thumb, in a very sweet way. Over the course of the summer, Emma will come to realise that’s she’s been mistaken about a lot of things. This is far less excruciatingly embarrassing than Austen’s ‘Emma’, but it’s really entertaining and fun. I enjoyed seeing Emma flirting (she doesn’t believe in involving her heart in flirtation), Ben taking a dislike to Wes Churchill, Emma describing Erick Elton as ‘a complete dudebro and obsessed with moving up the social ranks’ and giving pep-talks to her girls on why they shouldn’t let the boys win. She reminded me a bit of Cher from ‘Clueless’, which is a good thing, and the story was nicely romantic too, with some lovely hints on both sides that both Ben and Emma felt more for the other than they were admitting, a lovely story. ‘Mine’ by Cecilia Gray takes on ‘Mansfield Park’ which I think can be difficult to both update and make a short story out of. Here, Fanny’s mother is a photographic journalist, who travels extensively. This is why she takes up her sister’s offer to give Fanny a home rather than relying on paid childcare all the time. Fanny’s aunt has married an Irish man who already has children, and when they come to settle in the same town that Fanny and her mother live in it seems to make perfect sense. Eamon is special to Fanny from the first, and she’s very excited that he is coming home for the summer break from University. He’s been attending university in Dublin, so she hasn’t seen him for some time and she can’t wait to have him all to herself. Unfortunately he comes back with some friends in tow, the Crawford twins. She and Darcy (or Grumpus, as she dubs him) get off on the wrong foot, and since his friend and her sister are an item, they are destined to cross paths again. Now, though Darcy is rude in their initial meeting, Liz is rude pretty much every time they meet after that, though she is likeable when he is not around. Though Darcy seems to like her I couldn’t really see why as it’s not like there’s a veneer of charm over it like canon Lizzy and he doesn’t really get to see her much when she’s being nice. Her prejudice against rich men was a little hypocritical too, as she is a trust fund beneficiary, and hence, fairly rich herself, which she gets called on. There is an encounter with Darcy’s aunt Catherine which is pretty bizarre and quite funny. The story has romance, but I’d have liked Liz to have done a bit more of the running, even when she’s trying to make up with Darcy she is still quite high handed towards him, she came across as a little arrogant to me, so I didn’t take to her much, which is unusual for me, as I am a big Lizzy fan. All in all, this is another excellent addition to the ‘Holidays with Jane’ collection and I’d rate it as a 4 star read. I don’t know what holiday these authors will be celebrating next, but I’ll certainly look out for the next book when it comes out! * I received a review copy of this book from one of the authors for my honest review. 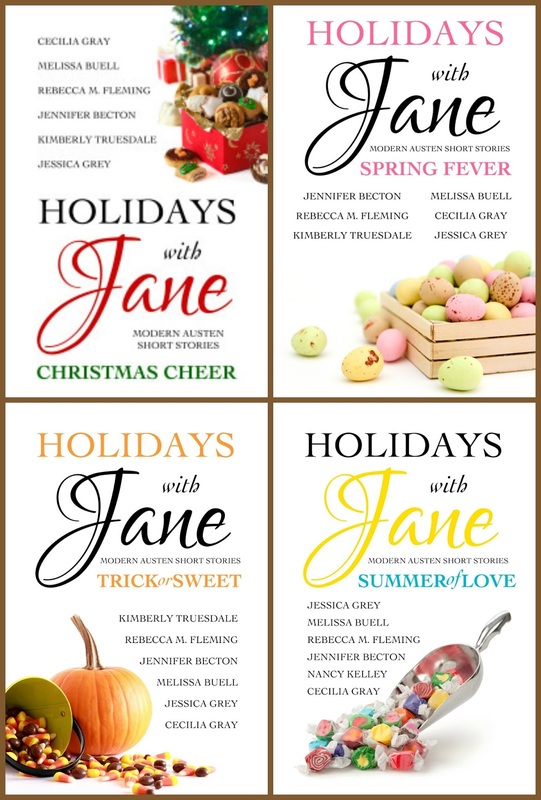 'Holidays with Jane: Christmas Cheer', 'Holidays with Jane: Spring Fever', 'Holidays with Jane: Trick or Sweet' and 'Holidays with Jane: Summer of Love' are all available to buy now! I really enjoy your reviews, Ceri, as so often your opinion of a piece matches mine. It will be interesting to compare my reading of these stories to yours. I have this on my Kindle but haven't opened it yet. Thank you for never giving away spoilers. I hate it when it happens on a review. I will be interested to find out whether our opinions of the stories coincide, Joy, please let me know what you think when you read them. I really appreciate your comment about the spoilers because I always try to keep things spoiler-free. I hate to read a review and realise that there is little point in reading the book because I know all the main plot points! Thank you for the fantastic review, Ceri! I'm so glad you enjoyed Summer of Love! Hi Jessica, thank you so much for the guest post and review copy. I very much enjoyed reading it, and as I said, your story was one of my highlights - Emma was lovely and Ben Knightley was adorable! She's an amazing writer. All of Jessica's book are wonderful! I've enjoyed all the books I've read by Jessica so far, and I still have some more to go. I am sure she will appreciate your comment! It's always fascinating to see Austen's stories moved into modern times and how the author works with the spirit of it. Some are ticklish. I do love seeing each given equal time here. I really need to read these Holiday shorts. You make a good point here, Sophia, some of the stories can be tricky to either modernise, or to make into a short story, or both! This 'Holidays with Jane' series has really made me consider that point. I hope you enjoy reading them when you get to them. I think the next one I'll try will probably be 'Trick or Sweet'. I bought it last autumn but didn't get around to reading more than the first story so I decided to save it till this autumn so I can enjoy some seasonal reading! Well that was a fun review! I appreciated your candor and which ones were your favourites! I have added this to my wishlist! Thank you! Thank you Carole! I appreciate your comments. I hope you enjoy this book when you read it.